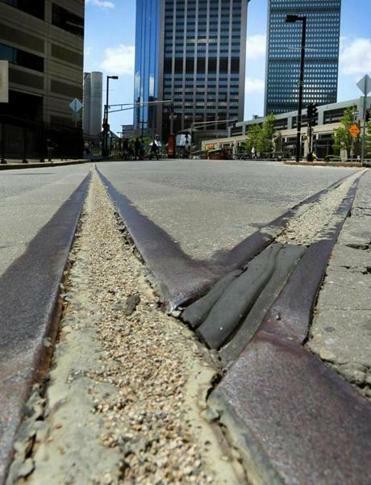 The state has filled an expansion joint at the intersection of Huntington Avenue and Stuart Street in Boston with caulking to prevent accidents. Better late than never — usually. The problem was first raised in this column just about one year ago: A roadway expansion joint at the Back Bay intersection of Huntington Avenue and Stuart Street had caused an unsuspecting cyclist, Anthony Beckwith, to take a nasty spill. Because the groove in the road ran almost parallel to his path, his wheel got caught, he flew off the bike, and he broke his leg. By the time the accident happened last June, Beckwith had already sent e-mails to city and state transportation officials about the groove. In October, the city of Boston (which does not control that stretch of road) added its two cents: City officials installed a sign to warn bike-riders and also added markings on the road to steer pedestrians across traffic and onto the left side of the road. Finally, last month the Massachusetts Department of Transportation came up with a permanent fix: installing neoprene caulking inside the groove. The caulking is similar to rubber, flexible enough to expand and contract with the roadway as temperatures change, but firm enough to keep bike wheels from falling into the groove. Anthony Beckwith will never have to experience this particular kind of bike accident again — at least, at this particular intersection. A few weeks after Beckwith’s experience was aired in this column, Michael Tucker and his wife, who live in Sharon, fell prey to the expansion joint. The rear wheel of his fixed-gear bicycle got caught, and he flew over the handlebar, while his wife crashed as she attempted to avoid him. Her head hit the pavement below the line of her helmet, and she fractured her skull and incurred hearing damage. Shortly after that, in late July, Michael Maciolek, of Cambridge, had a run-in with the joint. He broke his femur. In August, Jennifer Leonard went down. She e-mailed the city of Boston and said she never heard back. Scott Loose, of Belmont, got nabbed by the expansion joint in September. He still has visible scars from his meeting with the joint; now, he avoids the intersection at all costs when riding his bike. Peter Alpert, too, fell victim to the joint in September; he dislocated and broke his thumb, tore a rotator cuff, and suffered a massive hematoma on his right leg. “It was a hideous accident,” he said. Harrison Lee, of Brookline, watched another cyclist hit his head on the road in October. That cyclist later identified himself as Garry Haaland, of Newton. “I wonder how many other cyclists were hurt after your article, and after the caution sign was put in place,” Haaland wrote in an e-mail. When Paul Bologna, of Boston, hit the joint in February, he landed on a snowbank, with the cars behind him narrowly passing on the left. He was bruised, though otherwise fine. And in May — just days before the neoprene was installed — John Carper, of Cambridge, had a run-in. “Fortunately there were no cars near me when I went over,” he said. As much as the bikers said they were grateful for MassDOT’s fix, they wished it could have happened sooner. How many of these accidents could have been prevented if the fix had taken weeks, rather than an entire year? “On learning that the fix was only installed two weeks ago, I am moved to wonder: Why so long?” Maciolek wrote in an e-mail. “I think the solution is a good one, but it took too long to do it,” Carper said. One reason why the neoprene solution may have taken so long to become a reality is that the agency considered other options for a fix, Verseckes said. Among those possibilities was a proposal to bolt a thin steel plate onto one side of the roadway joint, which would have covered the groove but still allowed the road to flex. Officials decided against that idea, though, because they doubted such a setup could withstand the impact of snowplows through a heavy winter. Some bicyclists take issue with the city of Boston’s attempt to spotlight the danger. “A warning sign was placed a few feet before the expansion joint but was worthless because by the time you saw the sign one would already be in the expansion joint,” Jeffrey Allen said. Still, these cyclists continue to wonder: How many serious crashes could have been prevented? Charlestown residents, take notice: Starting June 16, the busy Route 99 underpass through Sullivan Square will be closed in the northbound direction, due to construction. It’s part of the $56.1 million project to reconstruct the Alford Street Bridge; the closure of the northbound side of the underpass is expected to last six weeks. Southbound traffic won’t be interrupted, MassDOT officials said. “Drivers that must travel through the affected area should expect delays and should reduce speed and use caution while approaching and traveling along the detour routes,” the agency wrote in a statement.